Recently Apple’s App Store hit 15 billion downloads – now Piper Jaffray has released some estimates on the Apple App Store. The companies believes that Apple is increasingly dependent on the health of the App Store. 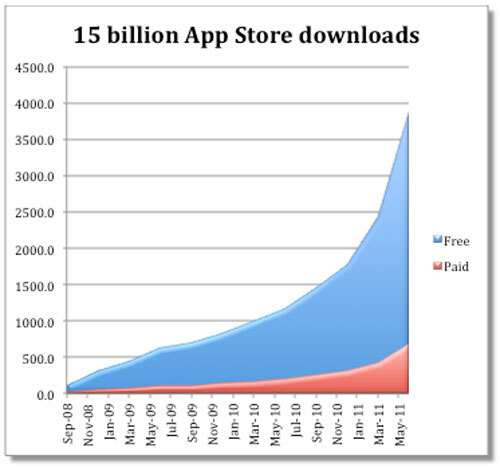 The analyst Gene Munster wrote the report and he said the App Store is doing good looking at 15 billion downloads. The report claims that the average iOS user will download 83 apps in 2011 compared to 51 downloads per user in 2010. That is an increase in downloads per user of 61% compared to 2010. The average price of the apps bought – as well – according to the report gone up 14% compared to 2010. The App Store is still the largest of it’s kind, notes Munster and pointed out that the App Store has 425,000 apps and the Android Market has 200,000 apps. Google’s Android Market has had 4.5 billion downloads compared to the 15 billion on the App Store. Note that the App Store has been around for a longer time than the Android Market. The report also shows that 82% of the apps on the App Store are free and the 18% of apps that are paid cost an average of $1.44 each.